I am a 29-year-old mama who lives in Leicestershire. I am a first time mama of beautiful little Thea and I live with my hubby Danny. I also have my other babies who are Poppy my Bichon Frise and Pru my Tabby Cat. Hope you enjoy this Blog and can relate to some of my posts! 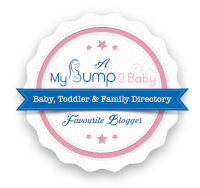 I am also a MyBump2Baby favourite blogger!